Hello, my wonderful friends! 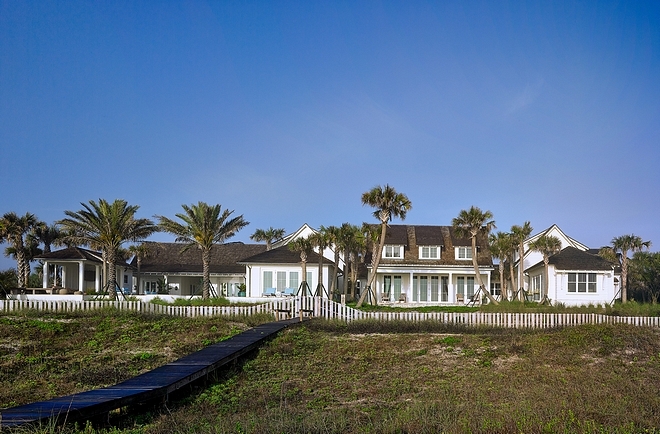 How great it is to end this week sharing this beautiful coastal Florida home with all of you. 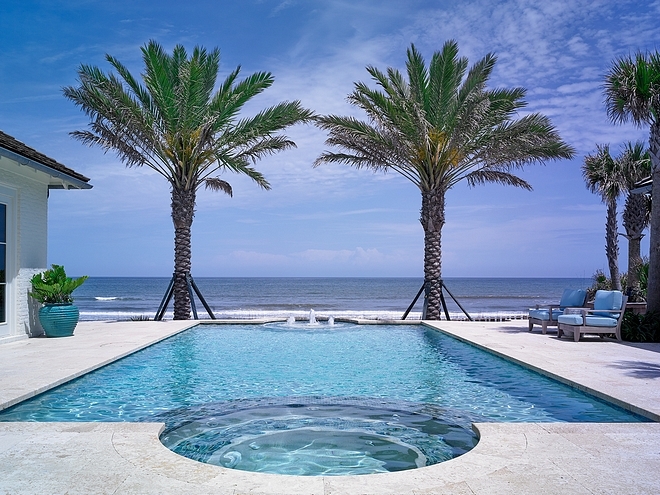 Located in Ponte Vedra Beach Florida, this is the kind of home that easily could be published on the cover of any magazine. 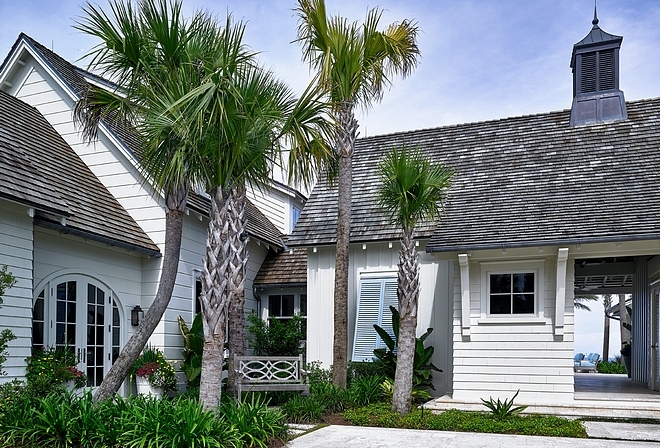 Brilliantly designed, this home features plenty of inspiring architectural details, which takes advantage of the stunning ocean views. 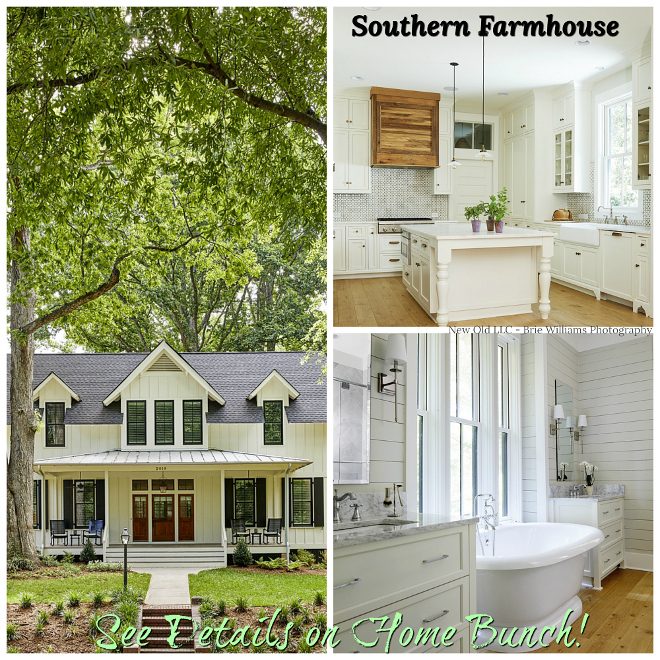 The interiors are current, fresh, and colorful but without losing elegance. 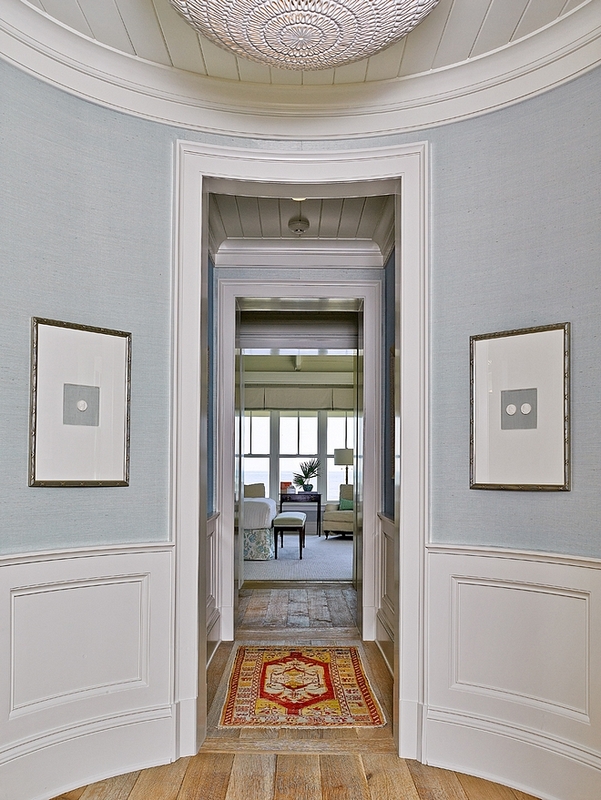 Cronk Duch Architecture was the architect and designed the interior architecture (moldings, openings, walls, etc.) 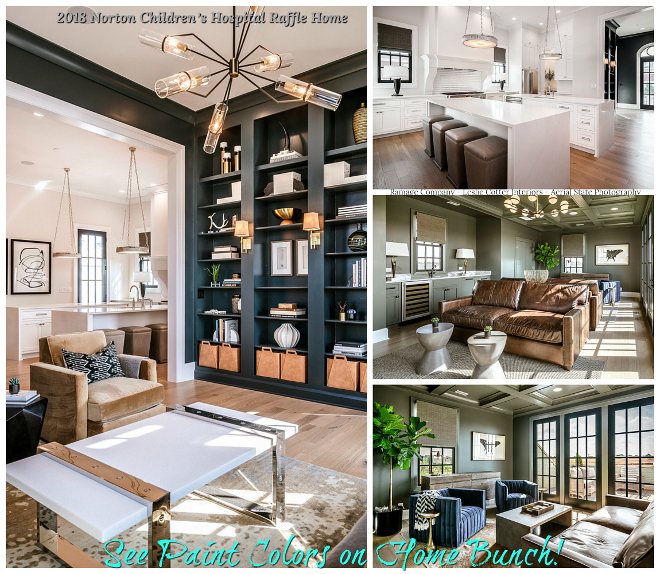 with Cynthia Collins of Collins Interiors (Dallas) as interior designer and stylist. 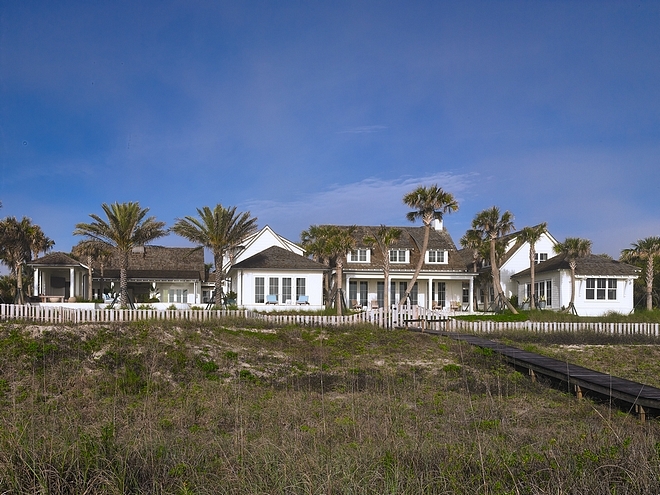 This is the type of beach house that welcomes and embraces you from the moment you look at it. 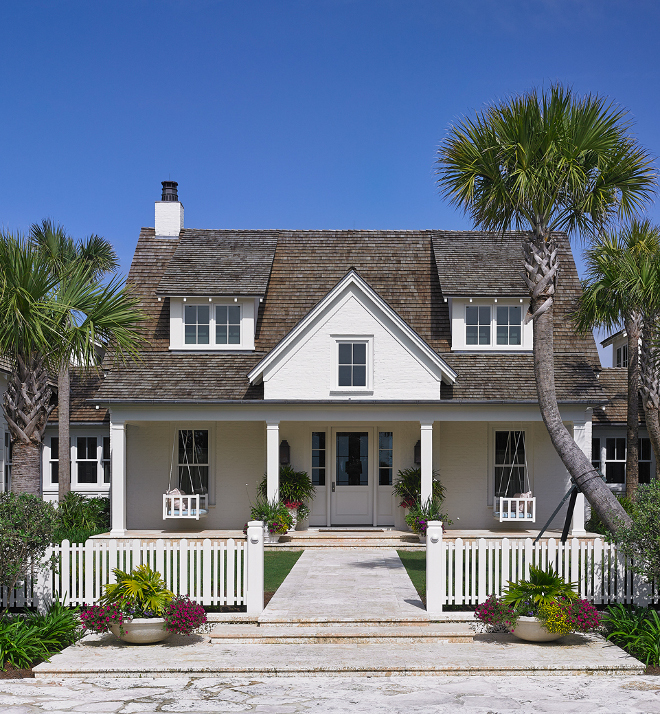 This residence was inspired by the cottages of Harbor Island and Hope. 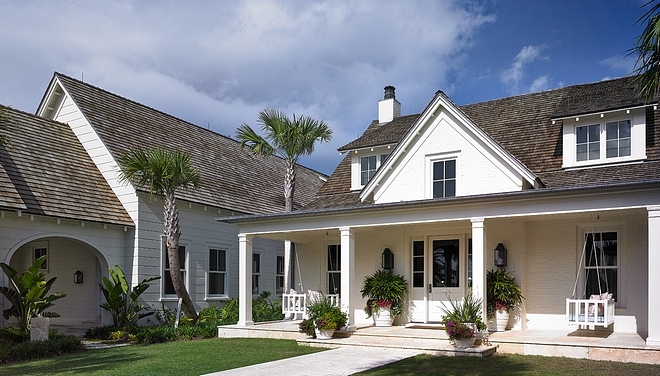 The outdoor paint color is a custom blend, similar to White Dove by Benjamin Moore. 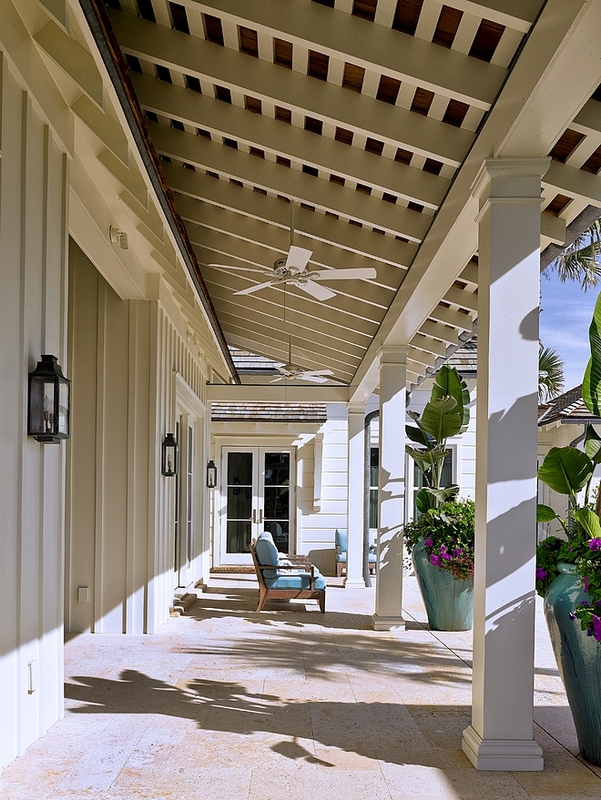 Outdoor swings are custom by Collins Interiors (CI) – similar here. 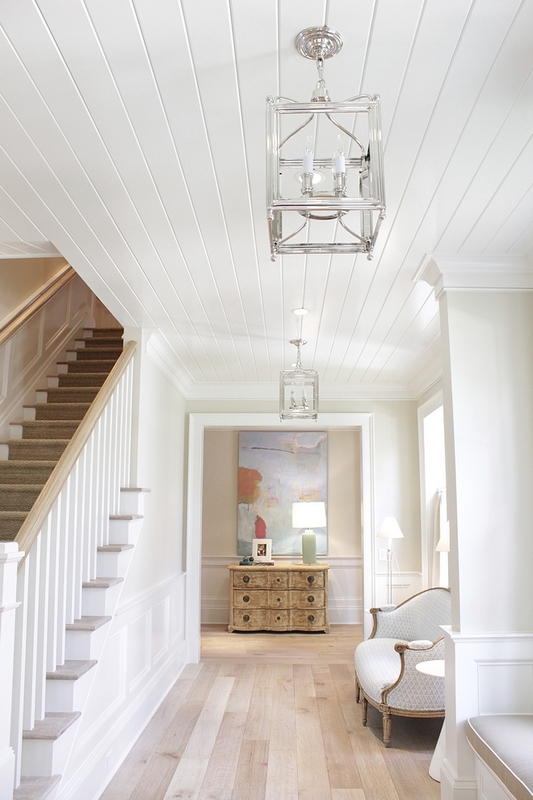 What a refreshing and timeless foyer! 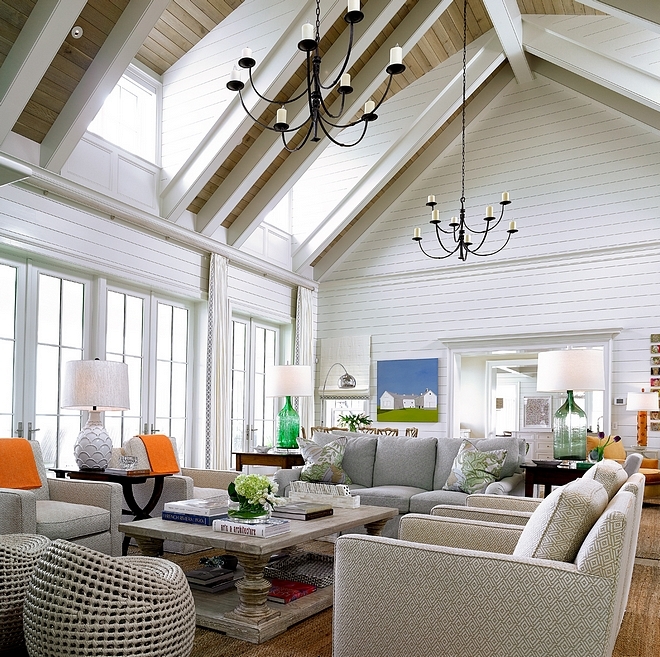 Walls and ceiling feature a combination of traditional wainscoting and tongue and groove paneling. Beautiful Chests & Dressers: Here, Here, Here, Here (large) & Here. Rug: Antique – similar Oushak Rugs: Here, Here, Here, Here, Here, Here, Here & Here. 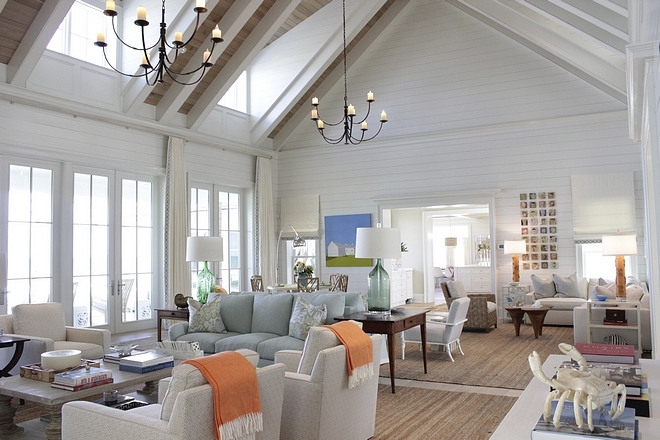 The Great Room is called as “Ocean Room” in this home. 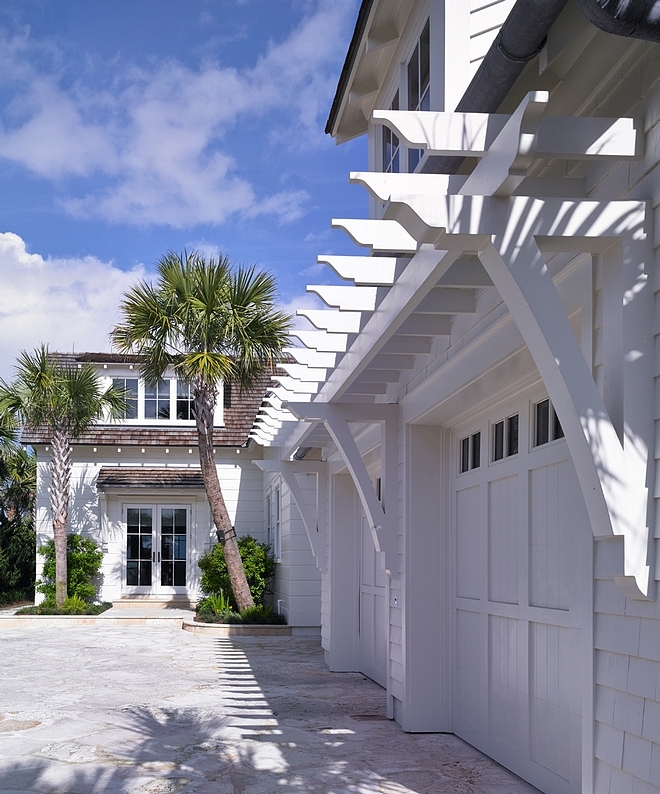 The vaulted high ceilings are adorned with White Oak tongue and grove while the walls feature white T&G. Swivel Chairs: Palecek Sphere Swivel chairs. Coffee Table: Blue Print Store- similar here & here. Pillows on sofa: Christopher Farr Cloth. 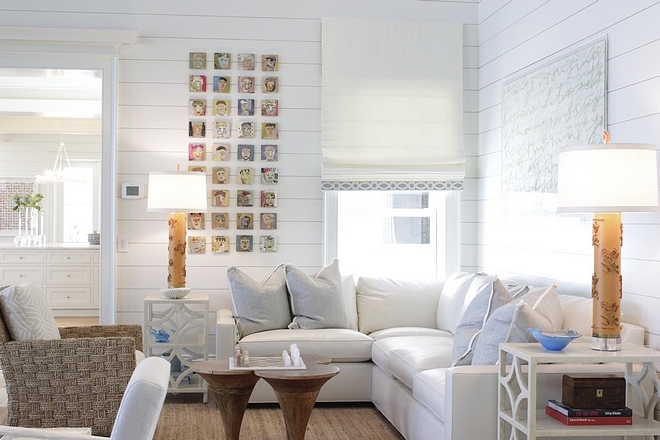 Walls are T&G in Benjamin Moore White Dove. Biedermeier Chest & Lamp: Blue Print store Dallas, TX – similar here. Art over Chest: Megan Adams Brooks. 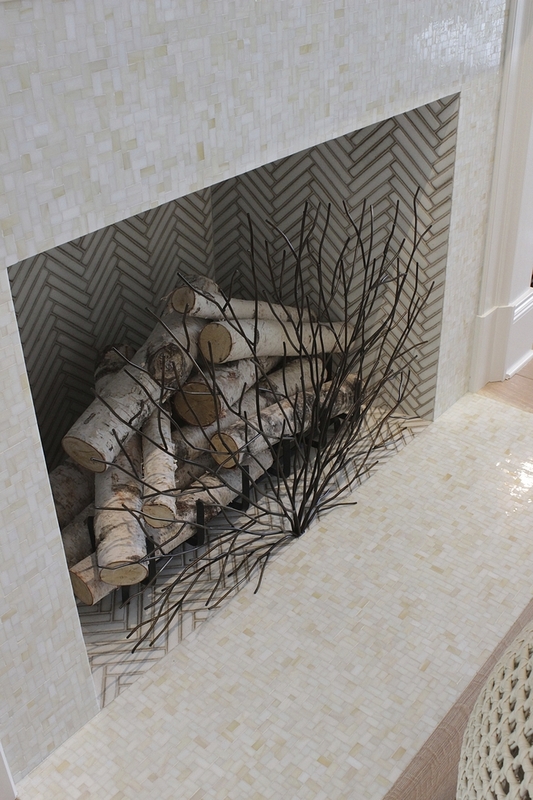 The fireplace features mini-mosaic tile and white herringbone tile. The chandeliers are custom. Other Beautiful Chandeliers: Here, Here, Here, Here, Here, Here, Here & Here. 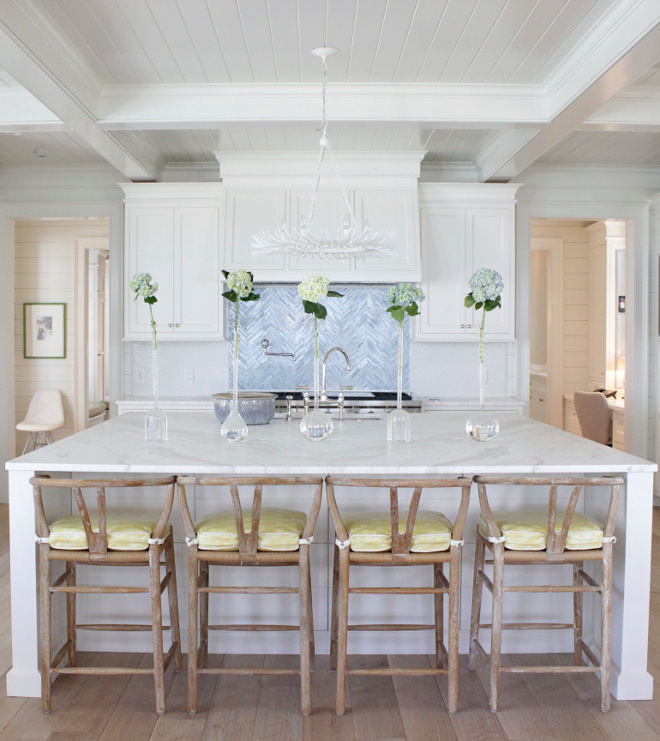 This area feels welcoming with a round white dining table and faux bamboo-looking Chippendale dining chairs. Similar Floor Lamp: Here & Here. 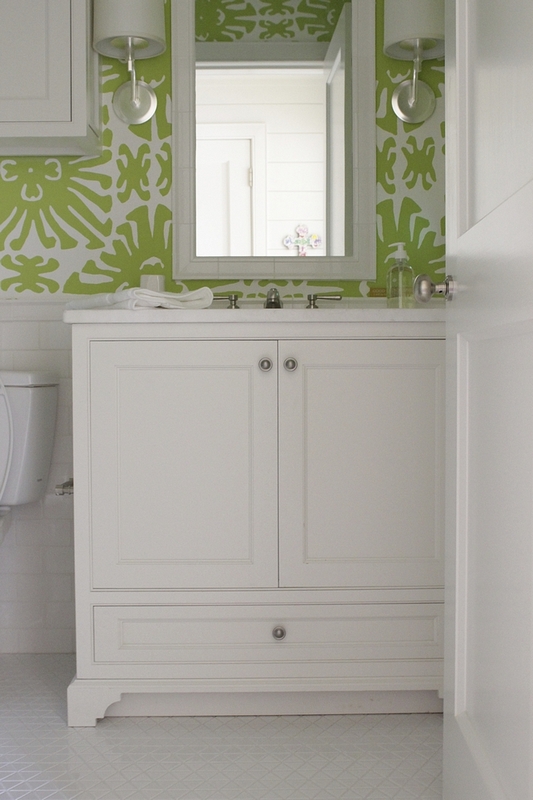 Cabinets are Benjamin Moore OC-17 White Dove and ceiling is also Benjamin Moore White Dove, in semi-gloss. 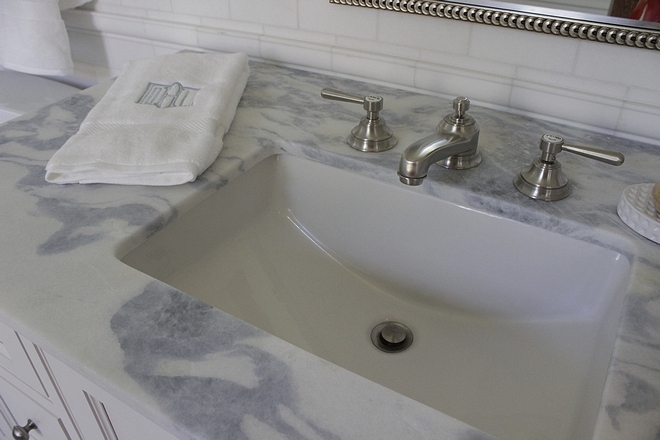 Kitchen Faucet: Here, polished nickel finish. Oushak Rug: Antique – similar here, here & here (larger). Similar Kitchen Hardware: Knobs, Pulls (only used on the refrigerator cabinet). Breakfast Nook (Far Left): Acrylic Base Dining Table & Chairs. 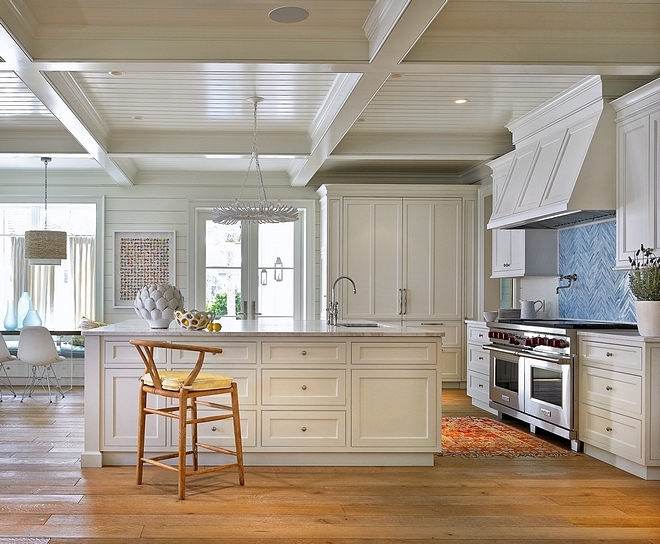 I love how classic yet clean-lined this kitchen feels. There’s nothing overly done in this space. Notice the fridge & freezer cabinet on the left and the pantry cabinet with a built-in tv, on the right. This beautiful accent backsplash tile above range is by Ann Sacks – Other Herringbone Tiles: here, here, here, here, here, here & here. 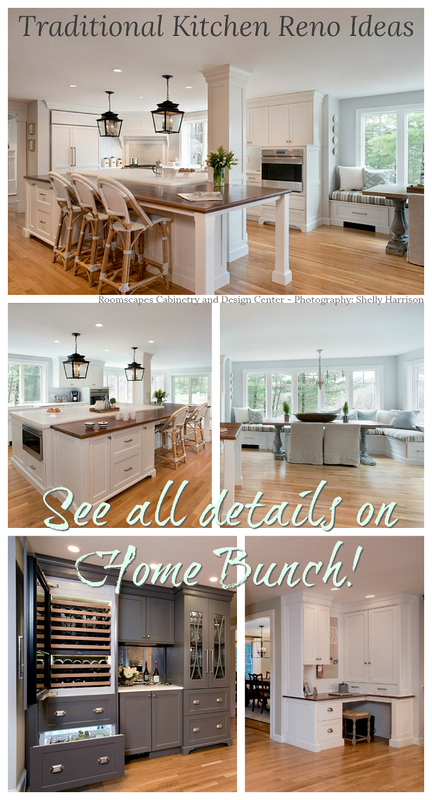 Similar Counterstools: Here & Here – Backless: Here. This has to be one of my favorites dining rooms ever! I say this not only because of the beautiful decor, but mostly because of the architectural details and the incredible ocean view. This space is simply perfect! 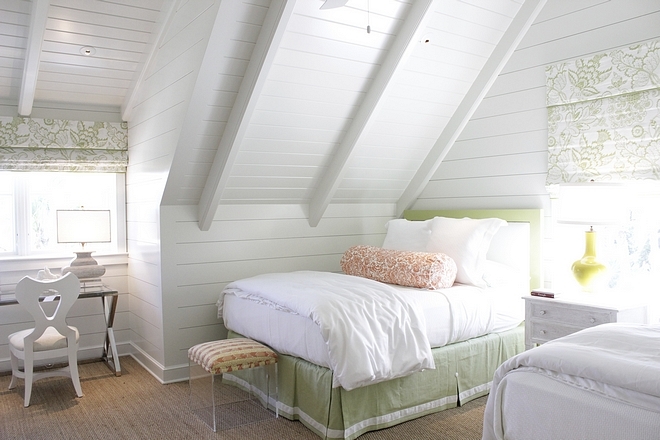 Walls and ceiling are clad in White Oak shiplap. Rug: Seagrass by Stark – similar here. Dining Table: Formations – similar here, here, here & here. 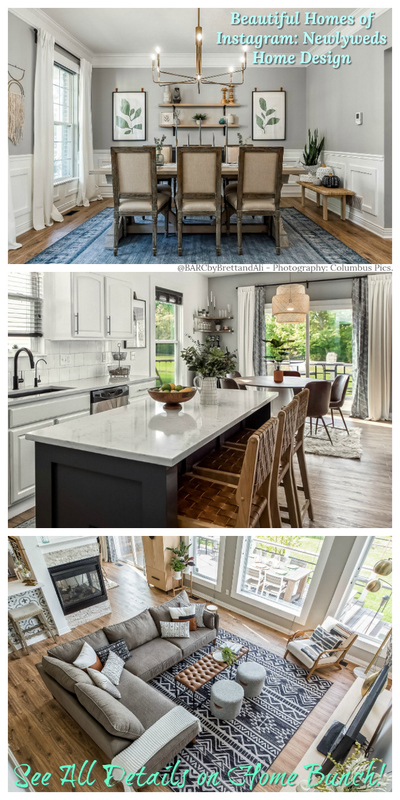 Dining Chairs: Dennis & Leen with Groves Brothers fabric – Beautiful Dining Chairs: here, here & here. Table Lamps & Sideboard: Blue Print store, Dallas TX. 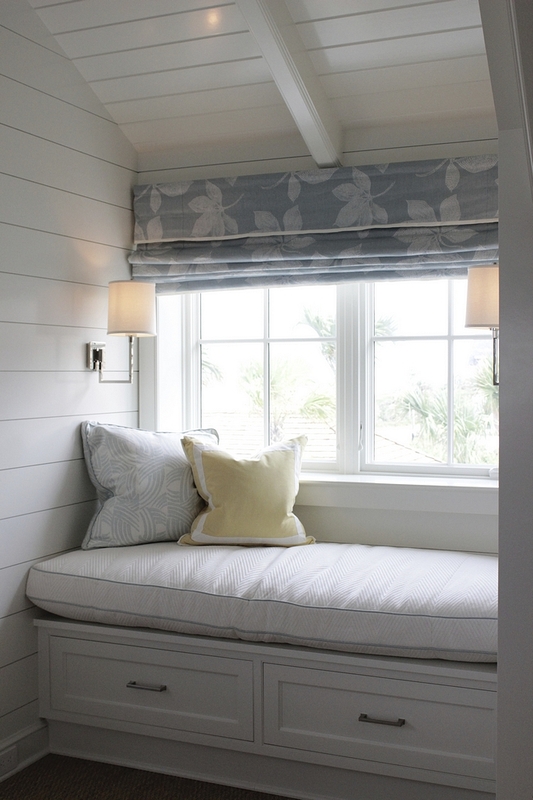 Window Treatment: Barbara Barry blue linen with Samuel and Sons tape trim. 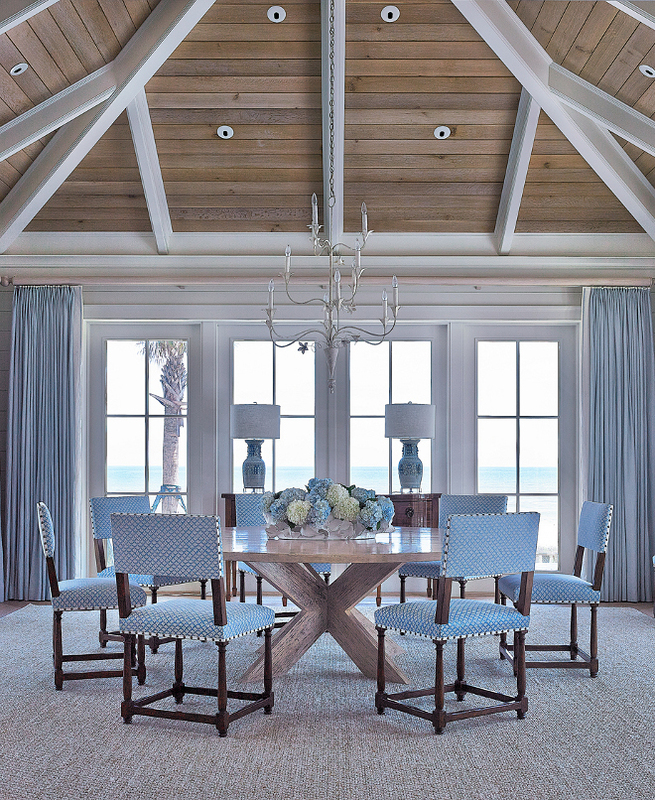 Who wouldn’t love to dine with an ocean view like that? 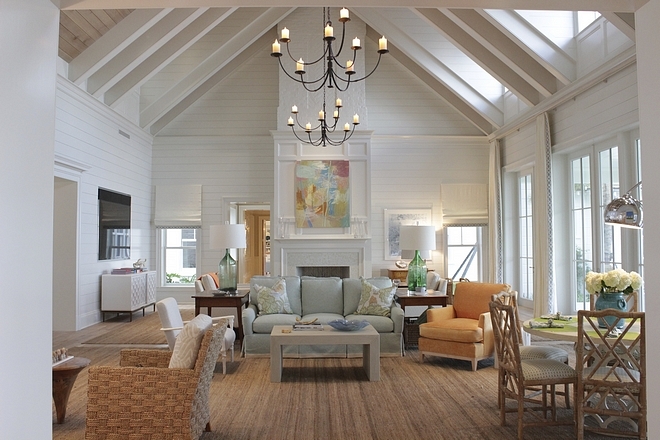 Lighting is from Urban Electric – Other Pendant Lights: Here, Here, Here & Here. 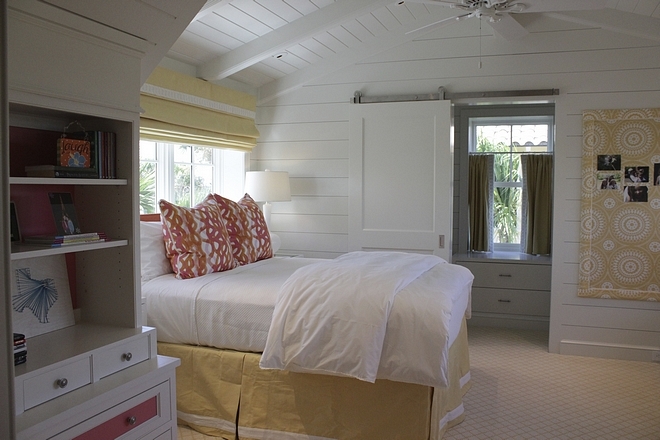 Ceiling is tongue and groove, painted in Benjamin Moore White Dove, semi-gloss. Hardwood flooring is White Oak. Similar here. Similar Dresser: Here, Here & Here. 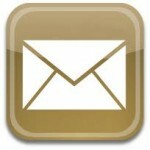 “Benjamin Moore OC-32 Tapestry Beige”. Art grid by Brenda Bogart. 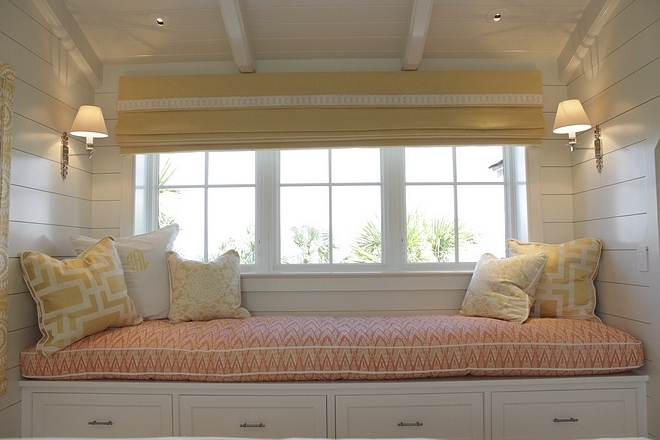 Bench: Jonathan Adler with custom fabric – similar here & here. 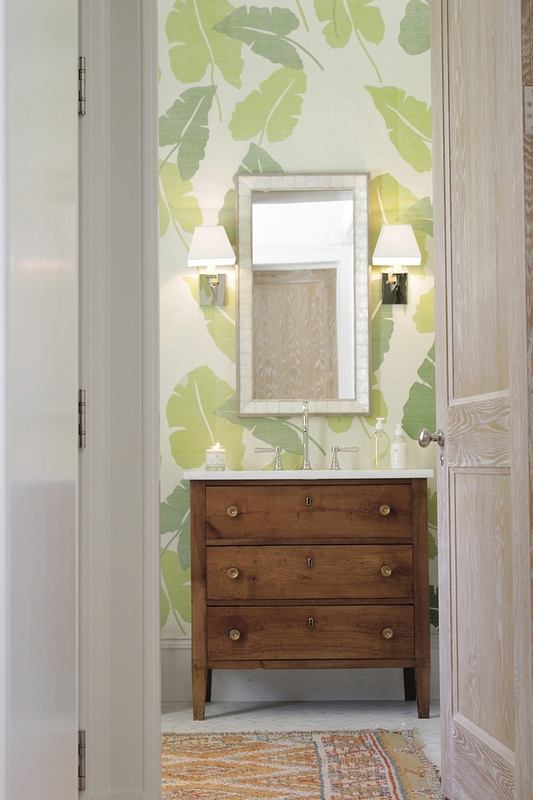 A banana leaf wallpaper brings a tropical feel to the powder room. Similar Wallpaper: here, here, here. 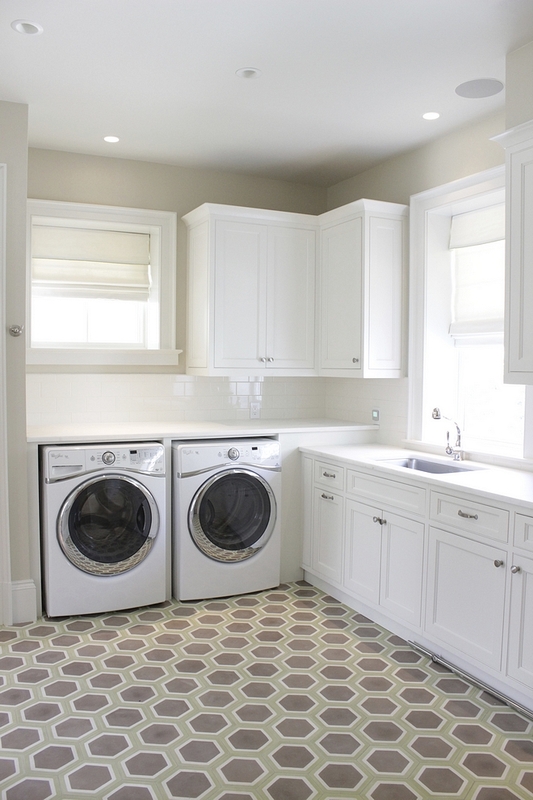 Laundry room wall paint color is Tapestry Beige by Benjamin Moore and cabinets are White Dove by Benjamin Moore. These neutral colors work really well together. 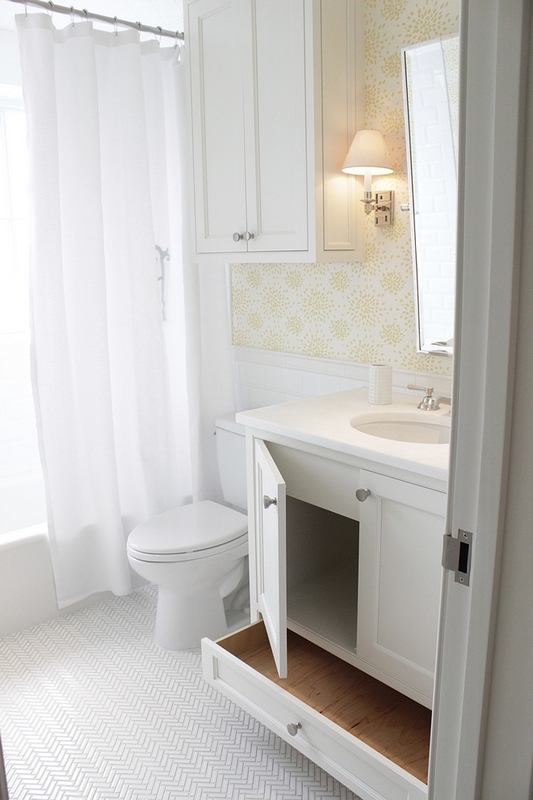 Cabinet paint color is BM OC-17. Fun & Colorful Wallpaper: Here & Here. 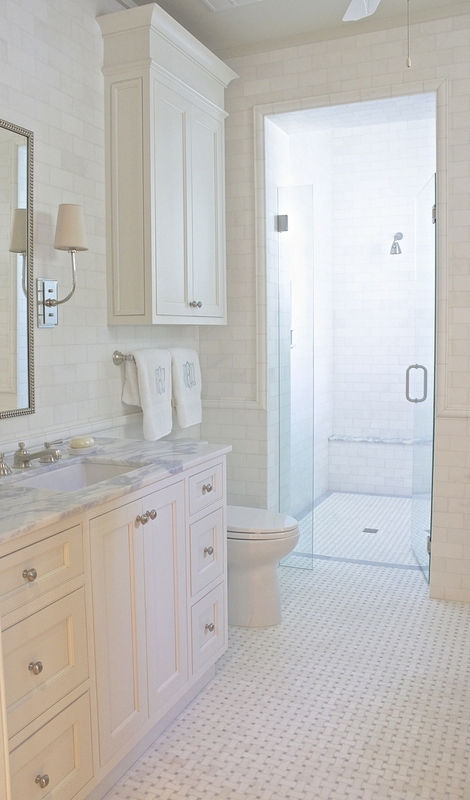 This bathroom features a classic combination of white subway tile on walls and marble basketweave floor tile. Notice the curb-bless shower. Isn’t this wallpaper adorable? 🙂 Wallpaper is Voutsa. 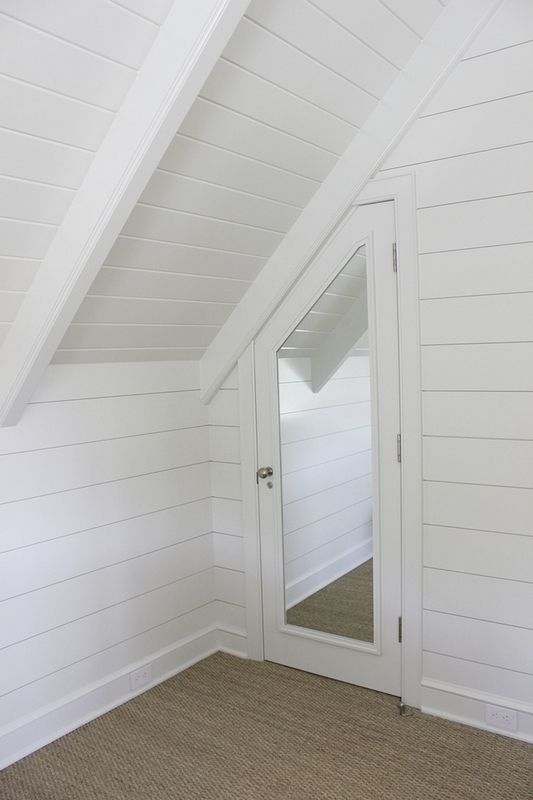 Ceiling: painted board on board – BM Dove White semi gloss. 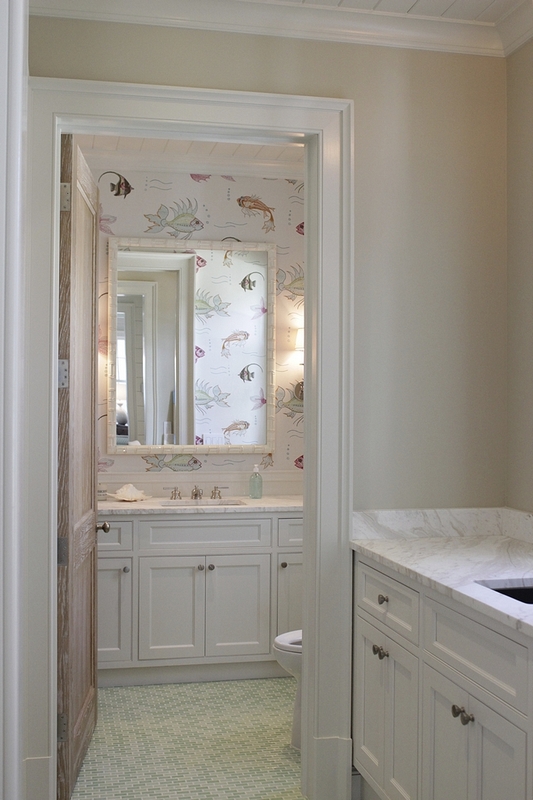 Walls are clad in Phillip Jefferies grasscloth wallpaper and classic wainscoting. Art: Antique Intaglios framed on linen from Blue Print store, Dallas TX. 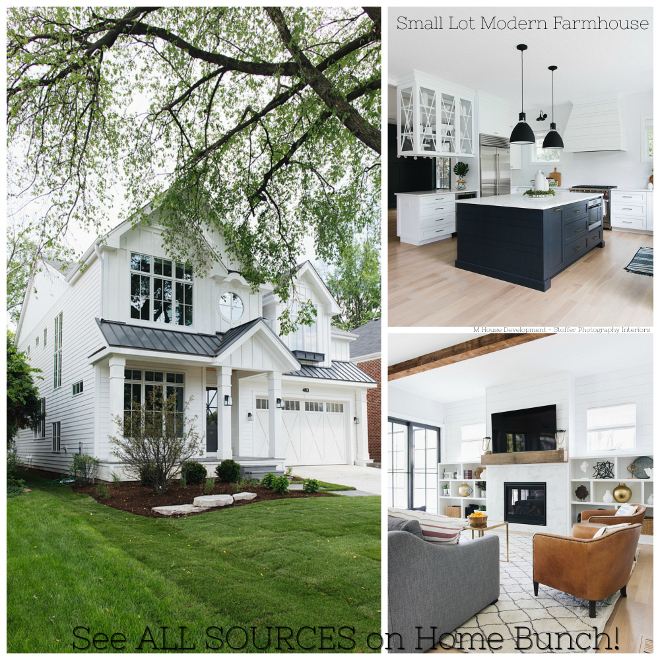 Lighting: OLY Studio – similar Here. Oushak Rug: Antique. Similar Runner: Here. 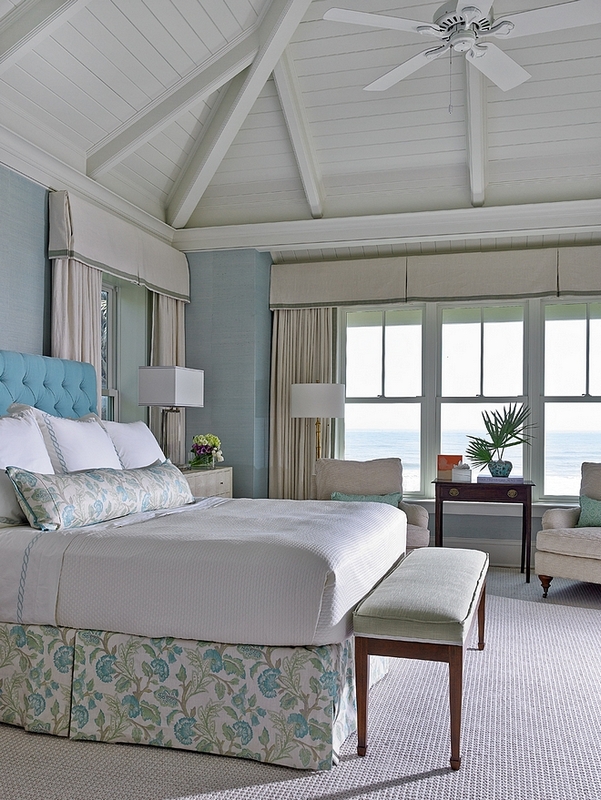 A bedroom with an ocean view? Yes, please!!! 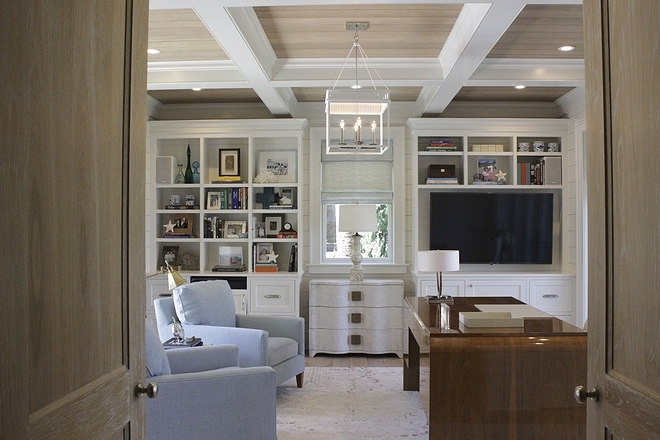 Ceiling is vaulted painted board on board – BM White Dove in semi-gloss. 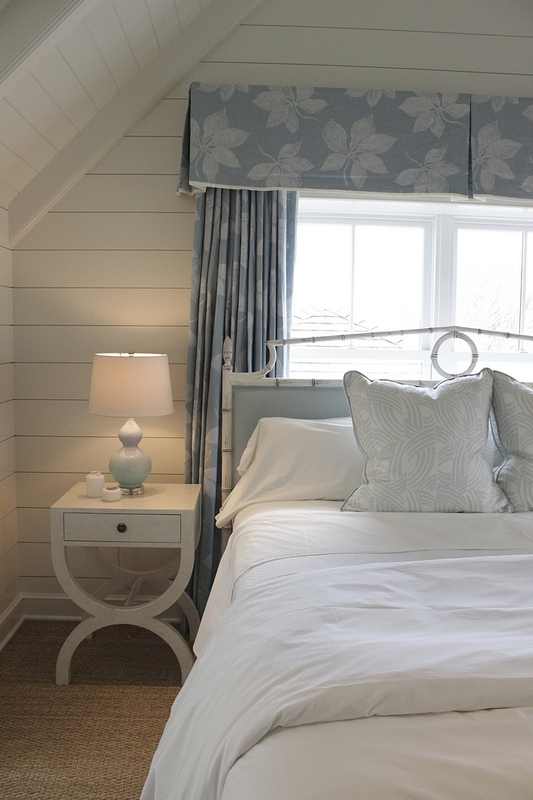 Linens : Matouk with custom pillows and dust skirt by CI – Travers fabric. 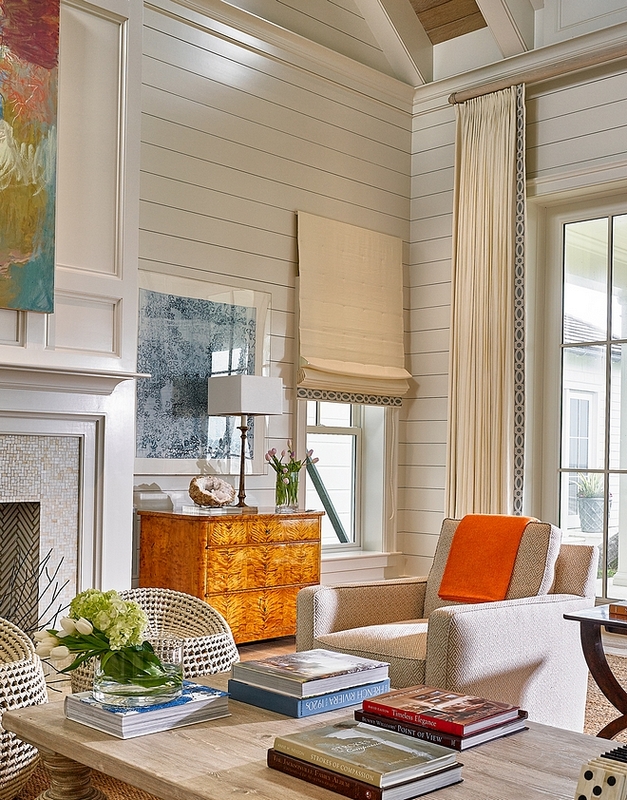 Walls: Phillip Jefferies grasscloth – similar here. 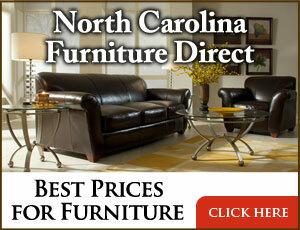 Bench, chairs, king headboard are all custom by CI. 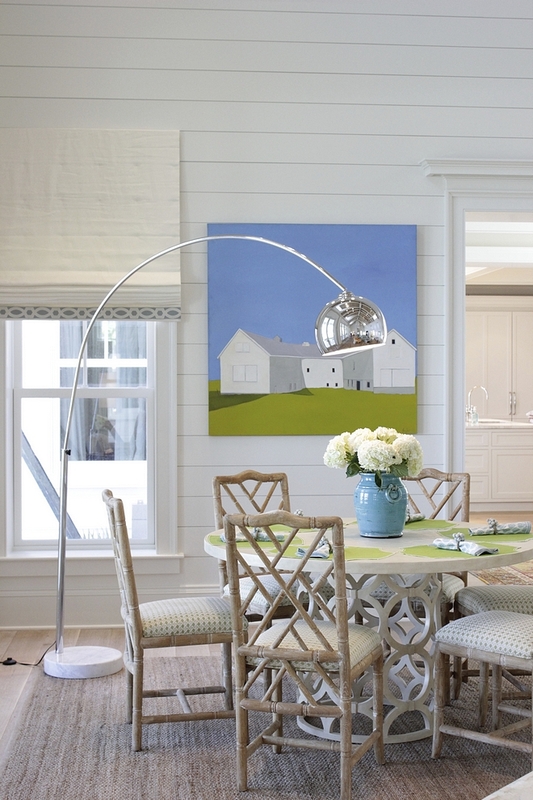 Walls are painted tongue and groove in White Dove by Benjamin Moore in semi-gloss. Sofa: custom by CI with pillows by Galbraith and Paul. Foosball Table: Rene Pierre Tahiti outdoor Foosball table. 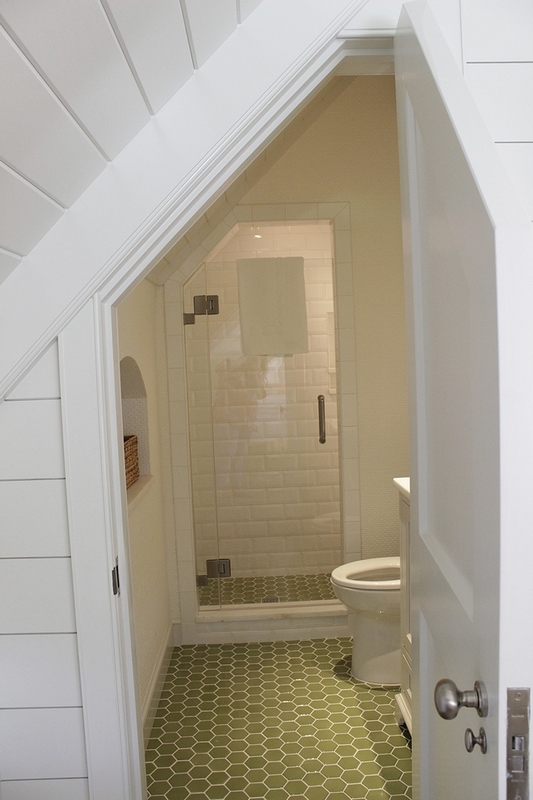 Rug: White Cowhide – similar here (herringbone). 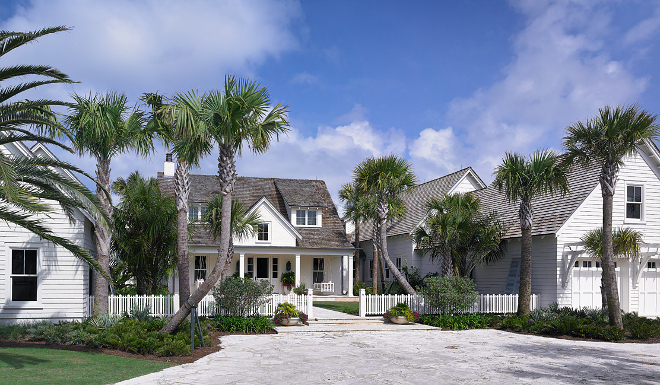 Outdoor copper lanterns are by Copper Sculptures – Other Beautiful Outdoor Sconces: Here. 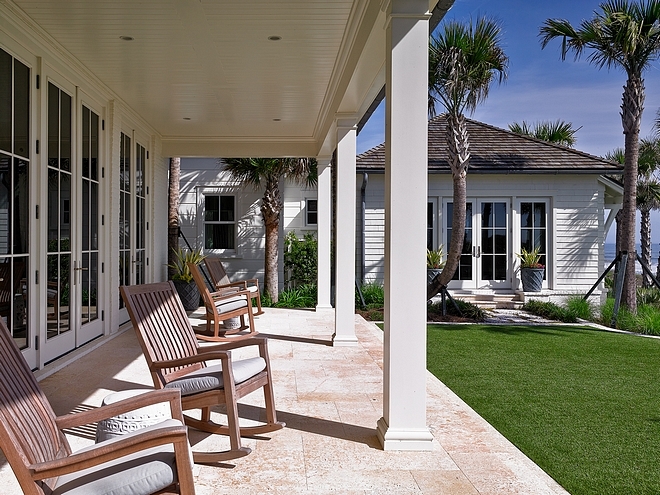 The outdoor furniture is Restoration Hardware w/ custom cushions and pillows by CI – similar here. Similar Rocking Chairs: Here, Here & Here. 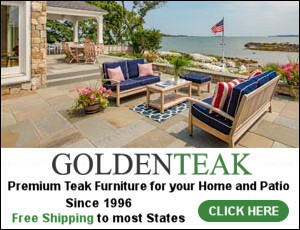 Garden Stools: Here – on sale! I would like to thank Joseph Stephen Cronk, Clifford G. Duch and Cynthia Collins for sharing the details above. 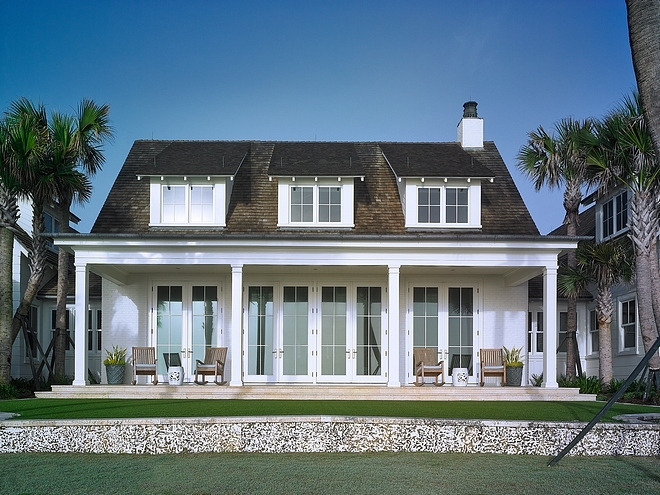 Architecture: Cronk Duch Architecture – Instagram. 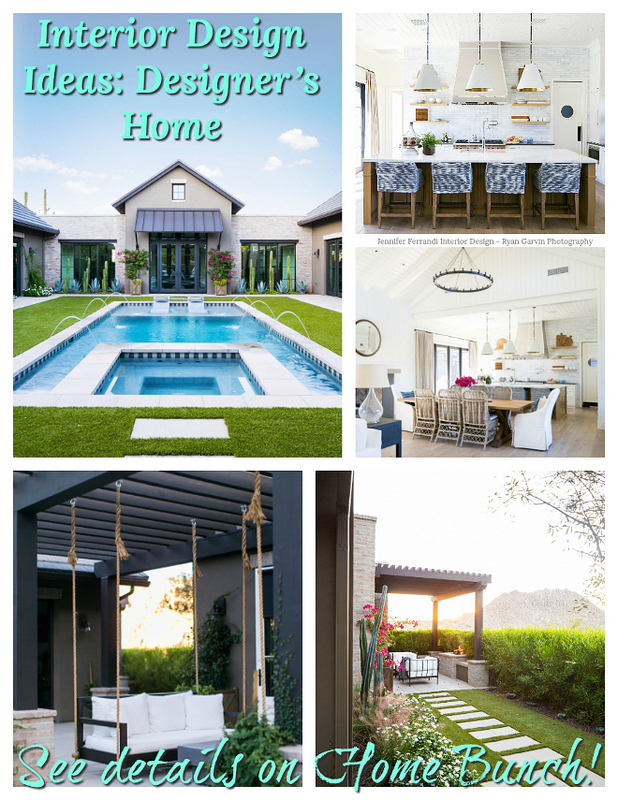 Interior Design: Collins Interiors – Instagram. Photography: Carlos Domenech Photography – Instagram. 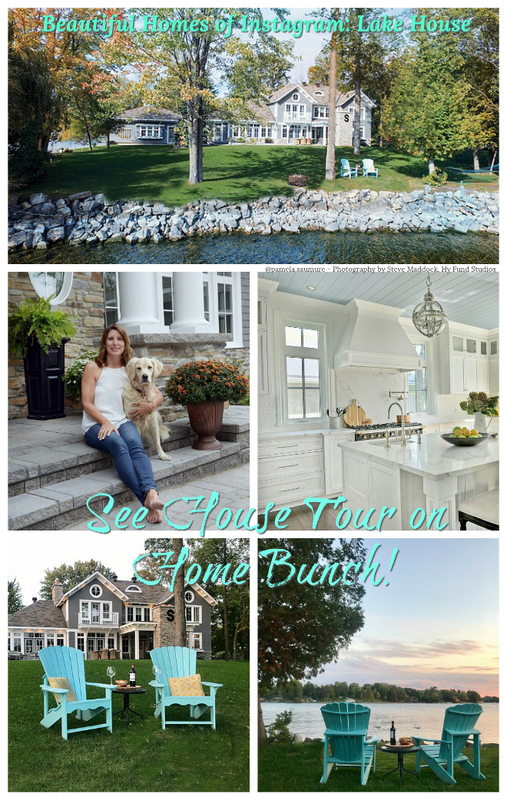 One of the prettiest houses I have ever seen! Any idea who the artist is that did the painting in the foyer? 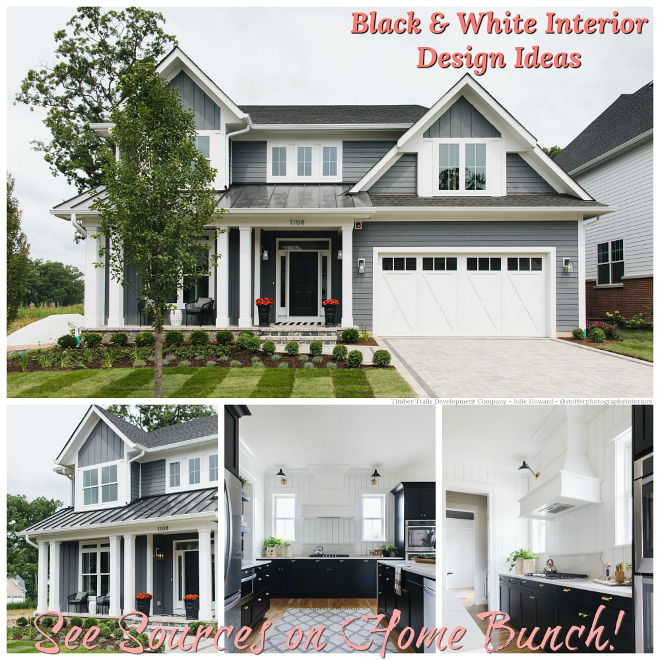 What an amazing home! Any idea who the artist is that did the painting in the foyer?